recruitment rally. This IAF recruitment is only for the Tamil Nadu state candidates and UT Puducherry candidates. 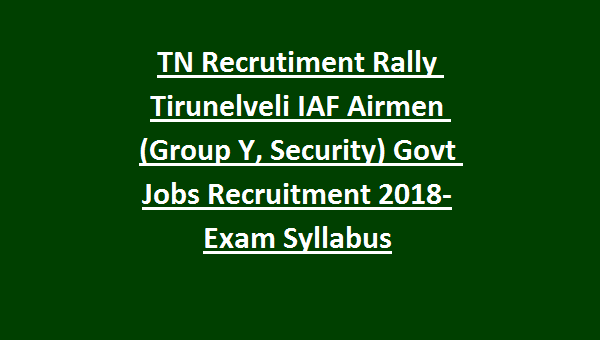 IAF Airmen Tirunelveli Recruitment Rally starts on 09-12-2018 and last date is 12-12-2018. Candidates who qualified Intermediate or 10+2 with 50% of marks they are eligible for applying this IAF Airmen Group Y and Security jobs. Candidate’s selection will be based on physical fitness test, written test, adaptability test, and Dynamic Factor Test for these Airmen jobs. 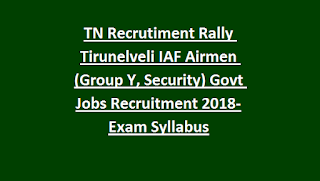 Exam Pattern and Syllabus, Model paper, age limits, and other details for this IAF Tirunelveli Recruitment rally are updated below. Number of vacancies available in IAF under Tamil Nadu cadre. Candidates who are born between 14-07-1998 and 26-06-2002 they are eligible to apply. Both the dates are inclusive. Intermediate or 10+2 with 50% marks qualified candidates are eligible to attend this Recruitment Rally of IAF Airmen. Candidates selection will be based on 5 stages. 1. 1600 meters running to be completed in 5 min 40 seconds. OMR based written exam will be conducted for this Airmen jobs. Exam duration is 45 minutes. Candidates who meet the eligibility criteria they can attend the Recruitment Rally at Tirunelveli for IAF Airmen Jobs. Attend directly for the recruitment rally as per the given schedule along with all original documents.